What goes up must come down. That’s generally the rule, anyway, certainly for spacecraft that have fulfilled their purpose and have no way to stay in orbit. Such is the case of Tiangong-1, China’s first space station, which after nearly 7 years in space is making an uncontrolled descent and should provide a nice fiery light show in the skies over… somewhere. Because there are so many unknowns about Tiangong-1’s trajectory, observers can only give an educated guess. The only thing they’re pretty sure about is that it’s going to drop some time in the next 24 hours — probably sometime tonight, and somewhere between 43 degrees north and 43 degrees south. But owing to the speeds involved and the inherently unpredictable nature of how a large body will tumble through the atmosphere, the exact time and location won’t be known basically until the event occurs. “At no time will a precise time/location prediction from ESA be possible,” explained reentry experts at the European Space Agency. That sounds quite dire, but it isn’t. Sure, Tiangong-1 is about the size of a schoolbus and weighs 9.4 tons, but unlike a meteorite of that size the station is hollow and fragile, and should break apart completely during its descent. There’s no danger, experts insist. No one is on board the station and it isn’t on a collision course with any crewed craft. It may seem a little crazy, but burning up in the atmosphere is just a part of the natural life cycle of large spacecraft. This one isn’t even that big. Tiangong-1 (the name roughly translates to “Heavenly Palace”) was launched in late 2011 in two parts, which connected in space — the first such feat accomplished by China’s space program. Over the next two years, three spacecraft docked with the newly formed station: one robotic craft, Shenzhou-8, and two crewed missions, Shenzhou-9 and 10, each with three on board. These missions proved the viability of China’s space station tech (another test platform, Tiangong-2, was launched in 2016), and in 2013 Tiangong-1, having accomplished what its creators set out to do, was deactivated. Its creators planned to have it execute a controlled descent at some point, using its thrusters to put it on a path to break up over the ocean. As little risk as there may be of debris hitting someone, it’s good practice not to take that risk if you don’t have to, and good manners not to dispose of your space junk over someone else’s country. 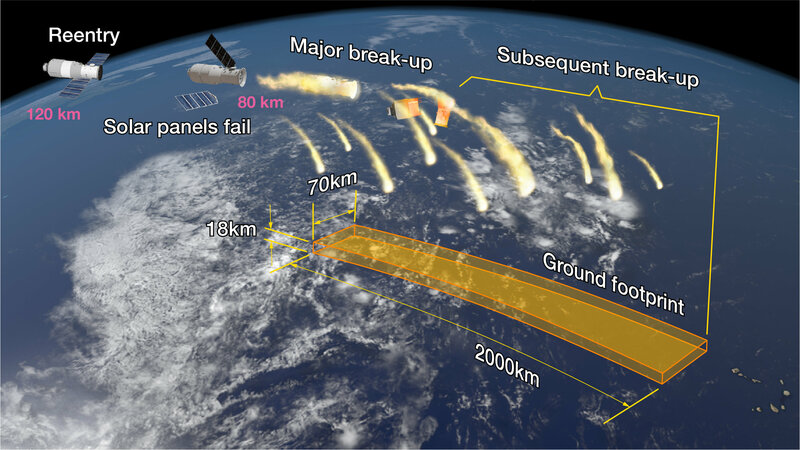 A helpful visualization of the expected debris footprint of Tiangong-1 from The Aerospace Corporation. Unfortunately, the spacecraft stopped responding to its handlers in China about two years ago, meaning that a controlled descent was no longer possible. As a result, Tiangong-1’s orbit has decayed naturally and it’s only in the last few months that it’s become clear when it would come down. Because we have no telemetry from the station, we only know what we can observe from outside the station (like Fraunhofer’s radar imagery, shown above), and a host of variables make it difficult to say anything with certainty. It wasn’t until this week that its deorbit path has become clear enough that space authorities are confident giving even a 24-hour window when it will come down. Those on the ground there may possibly be treated to a “splendid” light show, as China’s space agency put it, as if a large meteor is breaking up in the upper atmosphere. It should be visible for a minute or so as the station tumbles and breaks up and its constituent pieces burn. Predictions may get slightly better depending on observations, so I’ll update this post if the window is significantly altered.